LED Flameless Candles with Scent and Remote! Order a set of 2 or 3 (I think the 3 combo looks great together!). This candle set is safe, with LED technology that gives off a real flame like appearance. It’s an awesome candle to have if children and pets prevent you from getting lighting up when ever you want. The best part, you don’t have to give up the scent, as these candles have a light scent, much like regular candles – awesome, right? 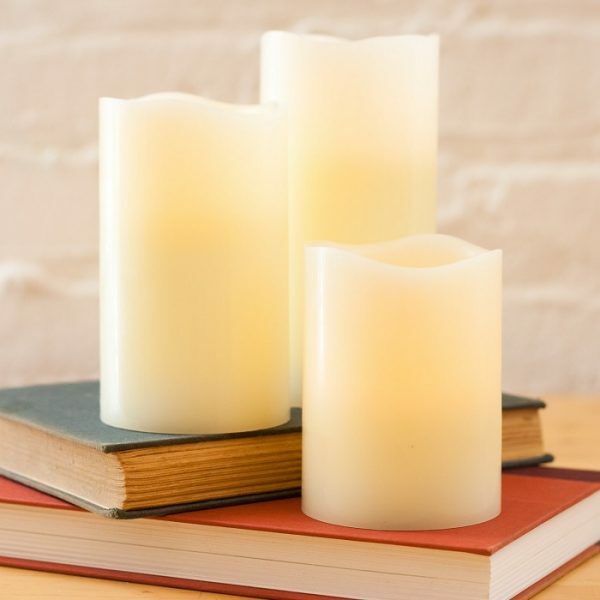 The set of three is sure to please with a luminescent, amber glow, hidden inside of a wax based flameless candle. Each set includes a remote control with a timer. Lighting options include – dimmer and two sequence options that allows you to choose from a static light or flickering glow, similar to a real candle. These lightly scented vanilla candles are perfect whether grouped for a more dramatic effect, or scattered about. Included in this collection are one 4″, one 5″ and 6″ H candles with 3″ D and require three AAA batteries each, which are included.